The Forum is conceived as a meeting point for representatives of governments and businesses from Montenegro and the UK and an opportunity for sharing experiences, knowledge, and skills for creating more favourable business conditions in Montenegro. MAUK is organising the event in cooperation with the British Embassy Podgorica and the Chevening Foundation. The two-day event will comprise three panel discussions and a business networking event. Representatives of business associations and government from Montenegro, the UK, and the region will meet to discuss the potential of regional business cooperation and UK investment. Participants will present British business success stories in Montenegro and the incentives and challenges they have faced along the road. They will also try to answer the following questions: How has the existing business regulation in Montenegro affected British businesses? 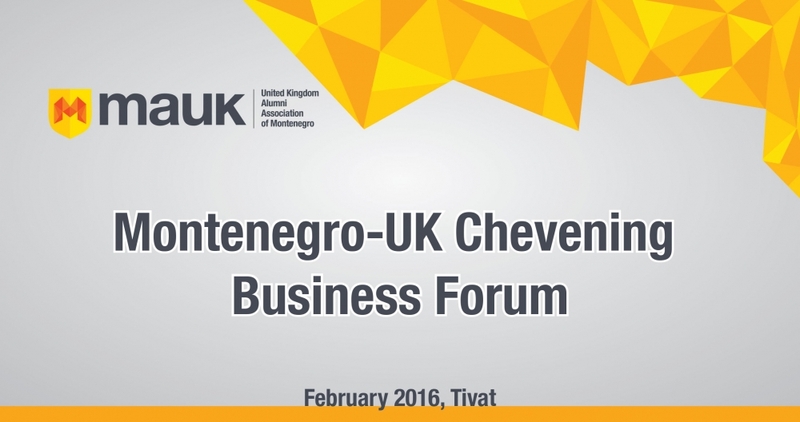 How can it create an environment more conducive to existing and prospective British businesses in Montenegro? Deputy Prime Minister of Montenegro and President of the Council for Improvement of Business Environment, Regulatory and Structural Reforms Igor Lukšić, and British Ambassador to Montenegro, Ian Whitting, will launch the Forum. Members of MAUK believe that entrepreneurial spirit and foreign investments should be in the focus of Montenegro endeavours, as reform processes are particularly important for smaller countries and open economies, in terms of entrepreneurial initiative strengthening and foreign investment attractiveness. MAUK is a non-profit organisation of Montenegrin professionals with UK higher education degrees which runs projects aimed at boosting Montenegro-UK relations and exchange in education, culture, and business.